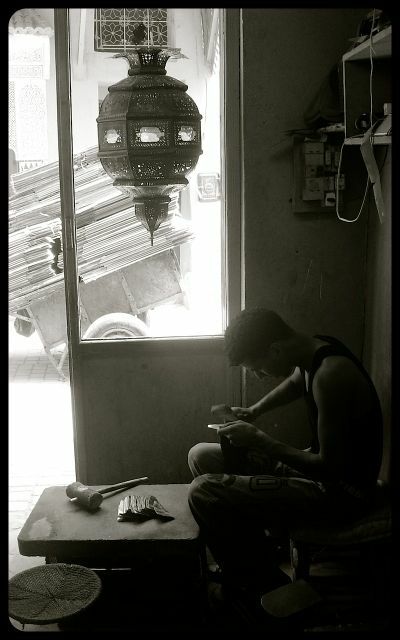 A young man in Marrakech shapes metal strips that will later be used to form the skeleton of a jewel-toned Moroccan lantern. 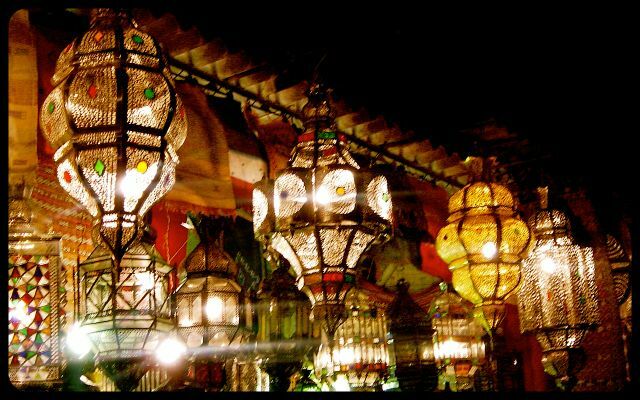 In the town’s souk or marketplace, a colorful array of these finished lanterns adorns stalls, making for a picturesque stroll by night when blocks are all aglow. 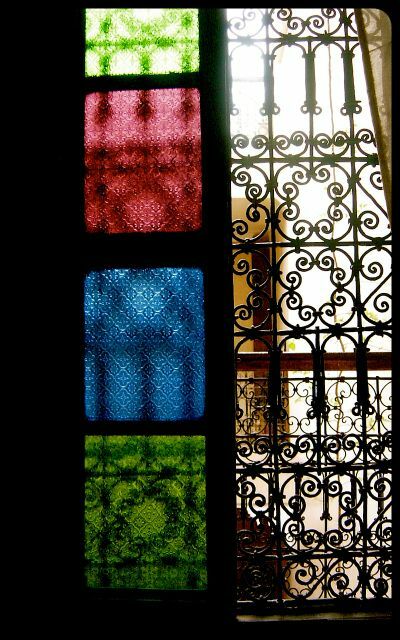 Palaces and riads (traditional Moroccan townhouses) glimmer with windows fitted with this vibrant glass too. Next postThe Taj Mahal in Black & White & Corn? Love that top photo, great capture. Mark, shoukran, as they say in Morocco! Thanks, Sonali. These lanterns certainly catch it well! So, how did the tajine turn out? How I miss the fresh orange slices with a splash of orange blossom water and cinnamon. Bon appétit! Sublime! I used the recipe I have on my food blog Mrs. Butterfingers, and substituted the lamb for the chicken. It was a mystical night at the Casbah. I didn’t know that you also have a blog devoted to food, Virginia. I’ll certainly have to devote some time to peruse it! What a Renaissance woman you are. What type of restaurants do you have, Virginia? How fun! You’re making me blush. V.
Marina, that opening lantern is actually quite neutral – so un-Moroccan! I did pick up two colorful ones, though – blue & a deep eggplant color. You will adore Morocco! From the unique cuisine, to the friendly people and exotic architecture and bazaars, it’s so fun to explore. Thanks as always for stopping by, Marina. I just subscribed to your yoga blog – hope it’ll inspire me to hit the yoga mat again very soon. Tricia – Morocco looks just lovely and the artisans in the area would be so inspiring to meet :) Just like your photo shows. I am glad you subscribed to my yoga blog.. I will be posting something soon. Just getting some coursework done which is delaying things !!! What a busy lady you are, Marina! How are you enjoying the program and the coursework? Beautifully atmospheric. You did extremely well to control what was a very difficult exposure indeed! Thank you, Rachael. I must confess that these shots were snapped two cameras ago with my point & shoot. :) Oh, again, I wish you were in the same neighborhood so you could give lessons! The lanterns are so spectacular! I would love to have one at home! Agness, it seems Morocco is calling you then! I actually did purchase a blue one. The jewel-like color is beautiful when the lantern is illuminated by candlelight.